Note to hardmod pandora users!! Also how to make a hardmod pandora!! Thread: Note to hardmod pandora users!! Also how to make a hardmod pandora!! This is for the OEM psp 2000 battery ONLY! ONLY FOR 100% HACKABLE PSP! For some reason I see on almost every post about how to hardmod a battery it tells you you cant make it a normal battery again. WELL the fact is you can!! Have a hardmod pandora you want to use as a regular backup battery? Heres an image of what to do! If you have a hardmod pandora you can just read the image! If you want to make a hardmod pandora you need to cut the wire labled1 . Ive drawn where to cut it, its the small black line it may be kinda hard to see. Careful not to cut the board up to bad, you only need to slice the wire! 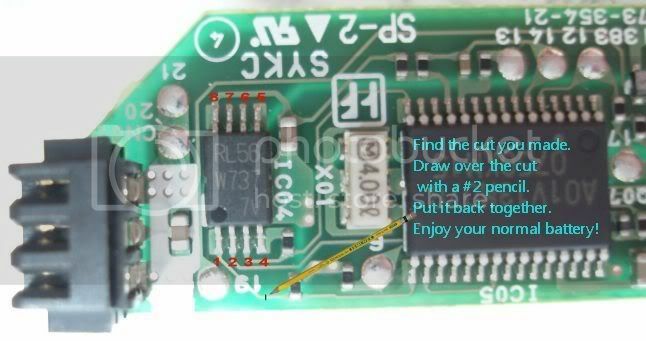 Once done with the reconnecting youll be able to use as pandora again by simply erasing the pencil. Graphite conducts electricity and thats why it will work regular again after! Enjoy and comment if you need any help on anything!